Various directors are asked about hollywood movies they’d be interested to remake as anime. It’s a good question which gets some good answers (some not even restricted to movies). 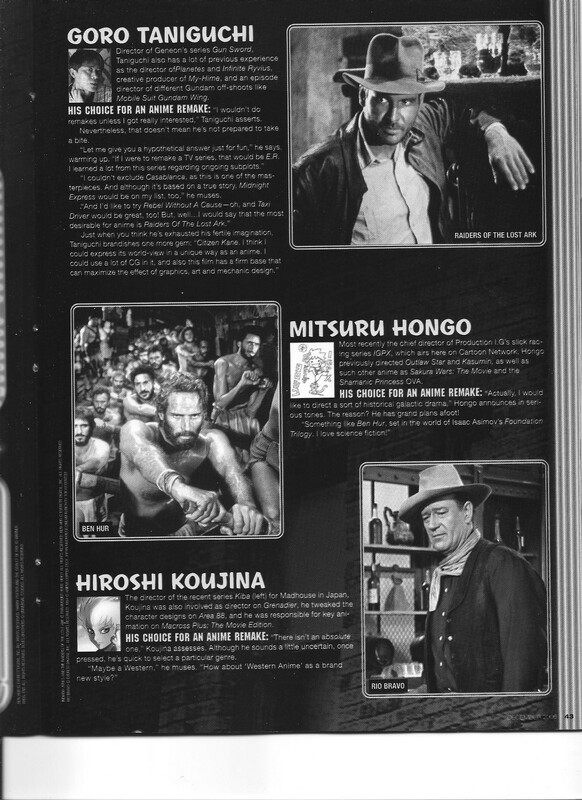 There are a bunch of cases of classic Western film and TV inspiring anime and manga (The Fugitive->Monster obviously so, Easy Rider->Gad Guard less so), but it’s neat to get a window into some of the less-obvious influences on a number of entertainers. Western or not, stuff like Taniguchi Goro learning about ongoing subplots from E.R. 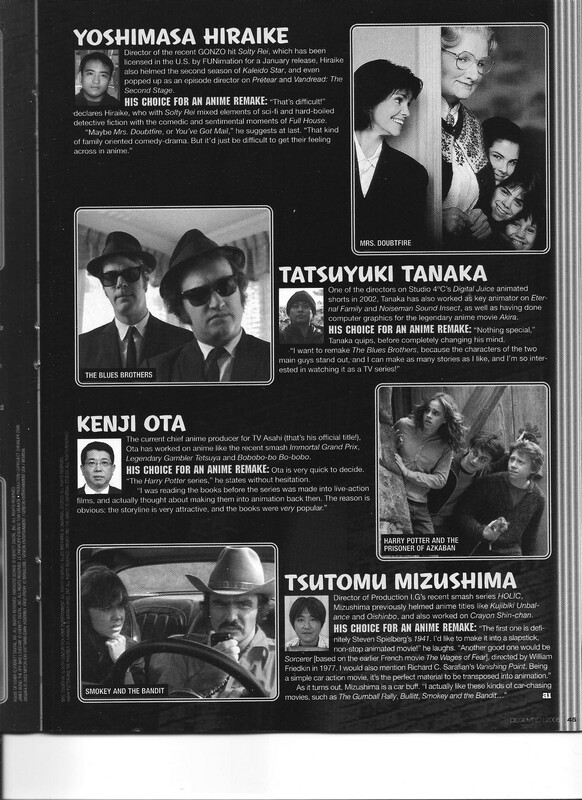 and Tsutomu Mizushima being a fan of car chases is fun to discover. 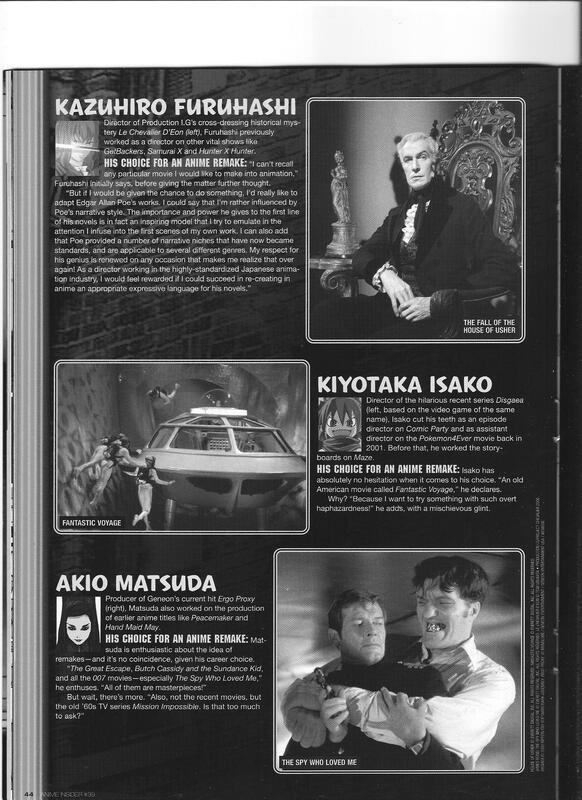 This entry was posted in Old Magazine Articles and tagged Akio Matsuda, Anime, Borderline Plagarism for the Freedom of Information, Film, Goro Taniguchi, Hiroshi Koujina, Kazuhiro Furuhashi, Kenji Ota, Kiyotaka Isako, Mitsuru Hongo, Tatsuyuki Tanaka, Tsutomu Mizushima, Yoshimasa Hiraike by torisunanohokori. Bookmark the permalink.